Spring is right around the corner, so today we are going to take a moment to talk about Match Day, an important time of year for real estate here in Augusta. Match Day is an annual rite of passage for medical students, a day when they learn which U.S. residency programs they will train at for the next three to seven years. Many of them end up right here in Augusta, which is why it’s such an important time of year for real estate agents. It’s a fun little sub-market because we sell a lot of homes in the historic parts of town, and every year it’s fun for us to help out those people who are doing their residencies in Augusta. There is a great opportunity here to buy a home because our housing is so affordable right now. It’s the perfect time to get a real estate education, as well as finish your medical education. Not everybody should buy, of course, but in Augusta, with such a rich medical history, it’s a great place to start the journey of homeownership. We really enjoy helping people make good real estate decisions right now, so they can move on properly in the future. be moving. Having that equity after you finish your residency is huge, and can make your next home purchase much more affordable. We can help you on either side of the transaction, whether you are just starting your residency, or finishing it up. If you have any questions about our market, or about how you can buy affordably in Augusta, give us a call or send us an email. We look forward to hearing from you! Rain, rain go away! It’s been a record year for rainfall in this area over the past year. How does all of this extra water and run off impact the real estate business? Lately, we have found a lot of water related issues in homes that had not seen any kind of moisture issues in the past. There are some simple things you need to keep in mind to prevent water damage from happening. For instance, ensure the gutters are cleaned and soil is graded away from your house. These simple steps will save you money in the long run. As a buyer, if any water damage gets caught during the home inspection, take a common sense approach. This is a seasonal issue, and there are things you can do to repair or prevent damage that aren’t expensive. Pay attention to your professional home inspector and other professionals on how the problems can be addressed. By working with professionals, you can determine which water issues are long term problems and which can be prevented in the future. Home inspectors, termite inspectors, and real estate professionals can guide you on how to handle any moisture issues on your property. How Can We Help You Make Augusta Your New Home? Augusta is filled with a large population of medical and military professionals, as you may have come to know. Often these professionals are transferred to other cities while others are moving into our city. This results in a constant relocation process that needs to be navigated by an expert. Corporate relocation if often thought of as is its own field of real estate. Ann Marie is certified corporate relocation specialist and has completed specialized training to understand the specific paperwork involved in relocation. There are many benefits associated with this certification and these benefits are awarded to those experts who follow the process through correctly. In a corporate relocation there are incentives for homes to sell in a certain amount of time, there are restrictions on the vendors that you can use to have a home pre-inspected, and there are lists and more lists and checklists that need to be completed. Corporate relocation is a time-intensive sub-specialty, but an important one for all who need to buy or sell a home quickly due to a job transfer. Ann Marie is an expert in this field; she understands the market and where the job transfers are coming from. She has the knowledge of housing needs based on previous experiences. She understands the aspects of various types of relocations and can ensure new residents get to know Augusta the way they need to. There are many factors that go into finding a home in a new area, and Ann Marie understands this. She prides herself on discovering the needs of each family, showing them homes based on their priorities, and then letting the family decide. Whether they want to be close to entertainment or a great school district, she will help them find a home in an area that is most beneficial to them! 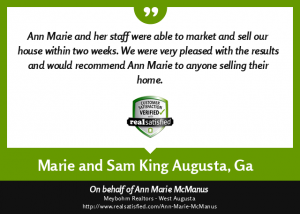 If you are relocating in or out of Augusta, please don’t hesitate to reach out to Ann Marie to get started. She would love to help you find your new home today! We’re grateful for another wonderful, successful year of business. We’re excited to wish you and your families a happy holiday season, too. We have some great holiday gift ideas to share with you all today. These could even help you buy that perfect gift for that person that’s difficult to shop for. People ask me about my knowledge of Augusta as a real estate expert. I’ve personally learned a lot about the area by reading. For instance, a book called The Story of Augusta, narrates a timeline of local history from natives to the twentieth century. All ages can appreciate these stories. Another great title is From Greenhouses to Green Jackets: Some History and Personalities of the Augusta National Golf Club and The Masters, which is a compilation of short stories. I also recommend Life Unexpected. These are all great gifts for anyone in the surrounding area. From our families to yours, Merry Christmas! If you’re interested in buying or selling a home this season, feel free to give us a call or email today. We’re happy to help. Augusta has a long history dating back to the colonial era. We sell homes that were built as early as 1810, and these homes are always intriguing because they have stories behind them. Savannah and Augusta are both colonial towns, and so we see our fair share of historic properties in this area. These old homes are often renovated and updated, but people still adore them. We even get calls from people asking for older homes to purchase. Owning a home with historical significance is quite desirable, and it’s even a good selling point. These older homes are quite unique when it comes to their style and living spaces. We recently sold a home that had been catalogued in the Smithsonian for its architectural significance. The gardens in these homes are also significant. We find old varieties of flowers and serpentine walls that everyone loves. If you’re interested in seeing some of our older listings, please don’t hesitate to contact us. We would love to show you these homes – and we won’t charge you anything for the history lesson that comes along with them! You put your house on the market, but you don’t have any offers. What do you do now? First, take a step back. If you’ve had showings without any offers, that could indicate a pricing problem. If your home is priced too high, it could help other properties sell. Similar homes priced correctly will seem like a deal once buyers have seen your overpriced property. If you haven’t had any activity at all, that points to a serious pricing problem. Have a serious conversation about finding a fairer price. You have to be aggressive. The amount of listing activity shows the potential a home has. If you lower the price, be decisive. Don’t just lower the price slightly. Buyers will notice, and instead of making an offer, they will wait for the next price reduction. While lowering the price a little bit at a time is a popular strategy, it’s not the best for you. When you want the pricing expertise of a proven professional who has studied homes and prices for over 30 years, give me a call. I would be happy to help you!